Have you ever noticed how some apps will have information pulled from your iOS Contacts list, like peoples names, numbers, and contact information? 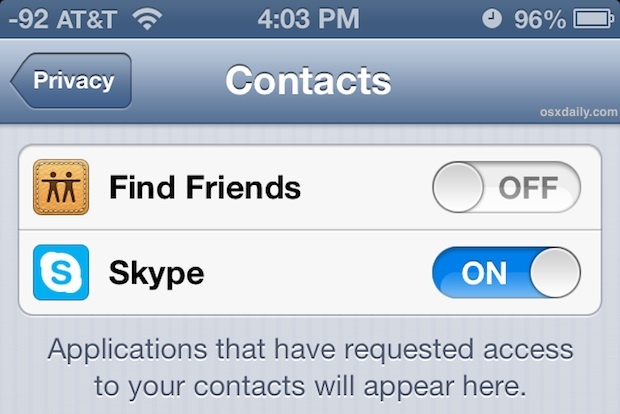 Or, contrarily, how some apps should have access to your address book, but don’t, and are then feature limited? Though this happens by choice, it’s fairly easy to overlook these settings during initial setup of many apps, or to forget which of the “Allow” or “Don’t Allow” setting you chose. Fortunately, this is very easy to see, and change in either direction. 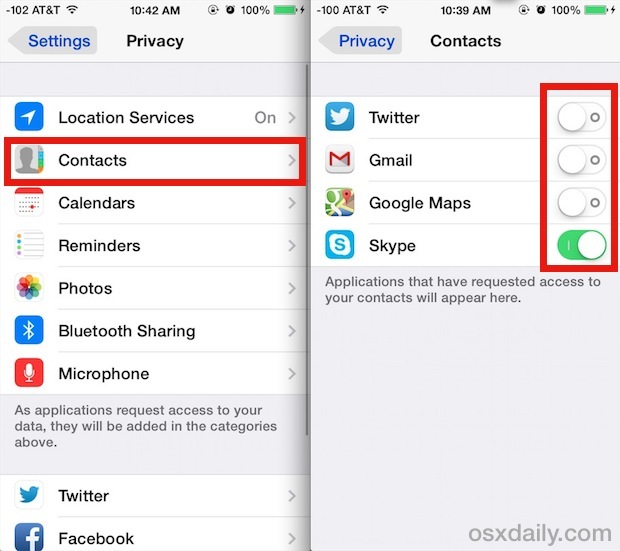 If you want to adjust which apps can and can’t have access to the Contacts list on an iPhone, iPad, or iPod, you will need to pay a visit to the iOS Privacy Settings on the device. This will show you a list of the apps that have requested access to address book details, as well as their current access privileges. Toggling these settings is what allows you to determine which app does or doesn’t have the ability to access general contacts information. Every app stored in this list has requested access to the Contacts list at some point, the ON switch means it currently has access, the OFF switch means it currently does not. You’ll often see a lot of social orientated apps in this list, like Twitter, Facebook, and Instagram. For good privacy practice, it’s wise to exclude access for apps that do not seem appropriate to need such information, for apps that you do not use, and from developers you do not trust. For example, if some single-player game from a sketchy developer is requesting access to the Contacts list for no apparent reason, does it really need this information to function and play the game? Probably not, and thus you may want to have apps like that set to off. On the other hand, apps like Skype and Google Voice do make sense to have contact information, since those apps are used directly for communications. Keep in mind that some apps will not function as expected, or at least not be full featured, if they do not have access to the Contacts list. For example, the Find My Friends app is basically useless without access to the address book, since it has no direct way to know who your friends are without accessing that list, or without being added manually. Modifying settings in this list will not have an impact on syncing Contacts between iOS devices or Macs, as that is controlled separately in iCloud settings. OS X users will find there is the same kind of control options on the Mac in System Preferences. What happens to those apps that currently have access to your contacts then you delete the app do they keep that data?? Can they still access your contacts? ?